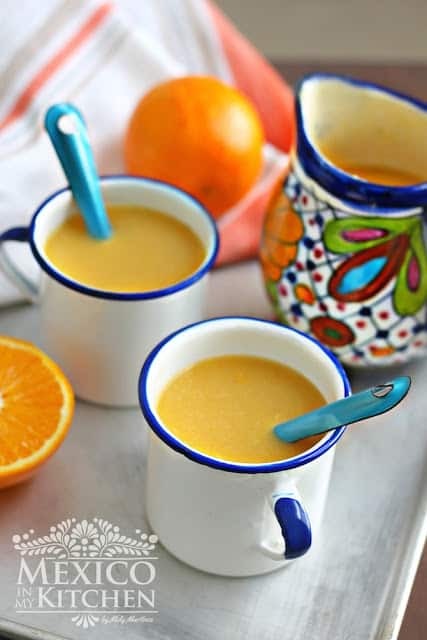 Orange Atole Recipe - Atole de Naranja, The perfect drink. As soon as the weather gets cold, I start making atole, which is one of the many things I learned from my mom and my grandma. I even remember that at my grandma’s house they used to make some black bean atole, and even though I tried it, I never really liked it. Black bean atole? Go figure! This is part of a special collaboration with Paypal and DimeMedia, opinions and recipes are 100% my own. Atoles are hot drinks that have a thick consistency, and you can prepare endless flavors of them using fruits, seeds, vanilla, or even legumes. Atoles made with corn masa harina, water, and piloncillo are a common drink in the rural areas of Mexico during the winter months. People add the flavorings according to what they have in their region. This Orange Atole, for example, is from the citrus-producing area of the State of Veracruz. In the cities, however, Atoles are more diverse and go beyond the classic corn masa type. Atoles made with milk thickened with cornstarch are more favored than the corn masa type. So here I am, enjoying this nice cold Texas weather, drinking my orange atole and still Christmas shopping online. Sadly, sending presents to my family in Mexico is not a good option, that’s why I prefer to send them money. Nowadays, that is really easy to do from my computer or even from my phone. Every year all my siblings pitch in to pay for Christmas dinner, which usually features a turkey or a leg of ham. I send my part to my brother using Xoom. Xoom is a money sending service that is very easy to use online or through a downloadable app on your phone. I used to send money to my mother through a bank, but it was very complicated for my family to be able to receive it. But now, using Xoom and PayPal, it’s very quick to send money, which is usually available within minutes at many stores that offer their service. My brother receives a text message with all the necessary information, and I get a text message as well letting me know when the money is received. It’s that easy! I highly recommend this truly great service, it makes sending money to your loved ones simply stress free. But now let’s get into this recipe that I know you will love! Place orange juice, one cup of water, and sugar in a saucepan. Turn heat to medium-high. Once the orange juice and water start simmering, stir in the corn masa-harina mixture into the saucepan. Stir, making sure everything is well mixed. Afterward, let it cook until it starts simmering, about 4-5 minutes, then let it simmer for 5 more minutes. Be careful when serving this drink, as its dense consistency keeps it very hot for a long time. Enjoy! For this recipe, I used White Enamel Mugs and Measuring Cup. This Orange Atole is from the citrus-producing area of the State of Veracruz. In the cities, however, Atoles are more diverse and go beyond the classic corn masa type. Atoles made with milk thickened with cornstarch are more favored than the corn masa type. 2 cups of orange juice* with seeds, removed. Place corn masa-harina in a small bowl and add one cup of water. Stir well until you have a very homogenous mixture. Make sure all the masa-harina has been incorporated into the water to avoid any clumps while making the atole. Set aside. Place orange juice, one cup of water, and sugar in a saucepan. Turn heat to medium-high, and once it starts boiling, reduce heat to a gentle simmer. · If you use store-bought orange juice, add less sugar, since it is usually sweeter than fresh home-squeezed orange juice. · Additional favoring: ½ stick of cinnamon or powdered cinnamon at serving time. Nunca he hecho atole de naranja y amo hacer atole. Voy a probarlo. Gracias! Ojalá lo pruebes, sabe delicioso! I think I may try making this as well. For the first time, I had atole de maiz at a party where most of the guests were Salvadoran. I grabbed a cup not knowing what it was and was truly shocked cuz I'd never had anything like that before. When I asked the folks around me what it was, they had trouble trying to explain it to me (even in Spanish). I can see how it would be a nice drink on a chilly evening outside watching a bonfire but it was a shock to have at a b-day party. But this looks good. Question: why do you say "Sadly, sending presents to my family in Mexico is not a good option"? My pen pal from Saltillo, Coahuila recently sent me a package FULL of trompos (I was asking about them and so she sent me a few), el juego Loteria which I always thought was related to fortune telling and so stayed away from with a 10 foot pole. Then she explained that it is the Mexican version of BINGO and now me and my son play it at home sometimes. She also sent me to tortilla warmers (cestas) y unas servilletas hecho por su mama. As well as a ton of Mexican candies which were too hot to enjoy and left me and my son baffled as to why they're even popular, haha. And a CD she made me of her daughter teaching me how they make tortillas by hand. I LOVED that package. Its soooooooo nice to get personal mail in the mail these days. After all these years (we met when I was 13-14 and I'm 47 now), we still keep in touch. I know, some some people it will be hard to explain about Atole. About you question. Well, it is really expensive to send packages to Mexico using regular mail, besides taking 3 week to arrive, the person that receives them something also have to pay taxes, if the packages is value is over $50.00 Dollars. It is easier to send packages from Mexico to the States, even using regular mail. Recuerdo las fiestas de mi infancia donde servian atole de chocolate o fresa y tamales, mas nunca me ha gustado el atole. No hablemos de tamles porque esos si, son mis favoritos. Mil felicidades en estos dias de Navidad, qye el Año Nuevo te traiga, paz, felicidad y salud.